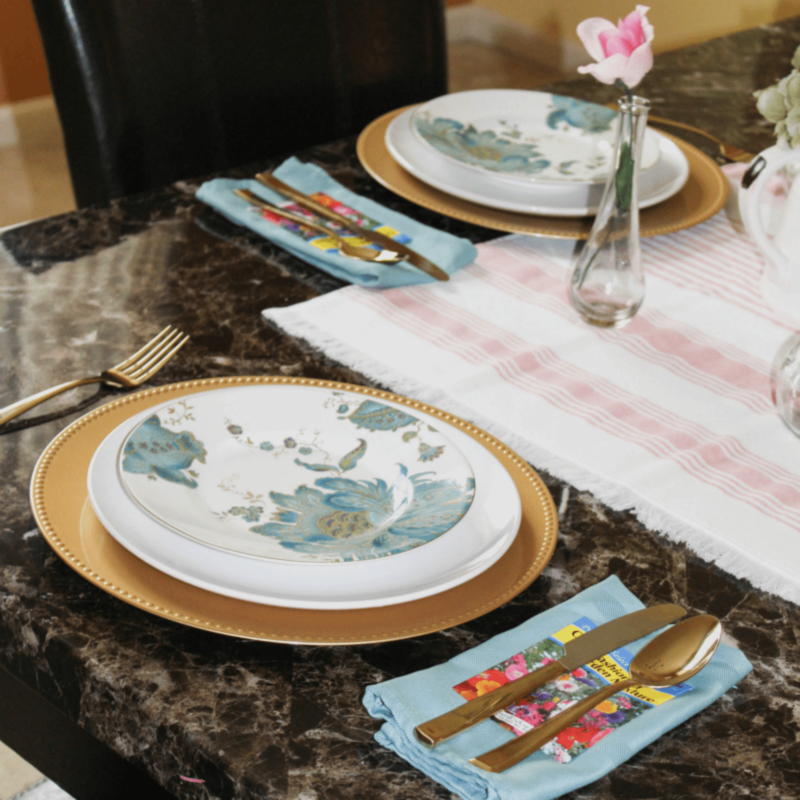 Setting a Spring table is a great way to bring Spring into your home. The colors are beautiful and the possibilities are endless. 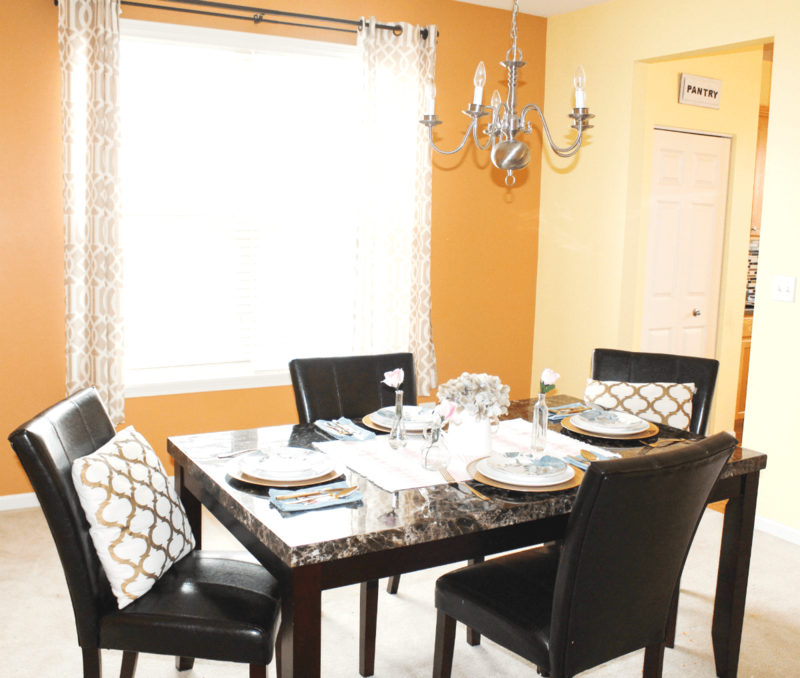 One of the best things about setting a table is the vast range of possibilities that come with it. There are so many ideas to choose. Any color, any style, any items, you pick!! 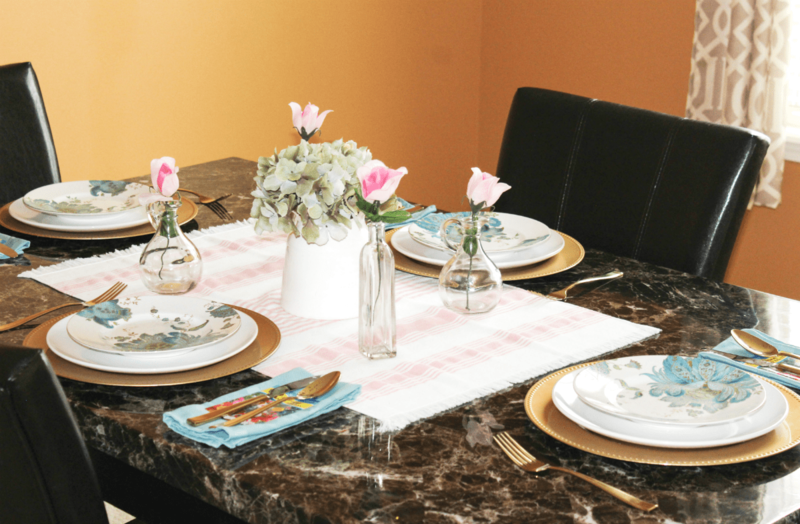 So many different ideas run through my head whenever I am planning to set the table for an occasion. I don’t think there is any right or wrong way except probably knowing where to place the serving dishes and other items used for dinning. You’ll notice that below because I’ve teamed up with a group of ladies who are sharing all kinds of Spring and Easter ideas. Thanks to Amanda from Life On The Bay Bush Blog for putting this together!! Be sure to check out the links at the bottom of this post for more inspiration. 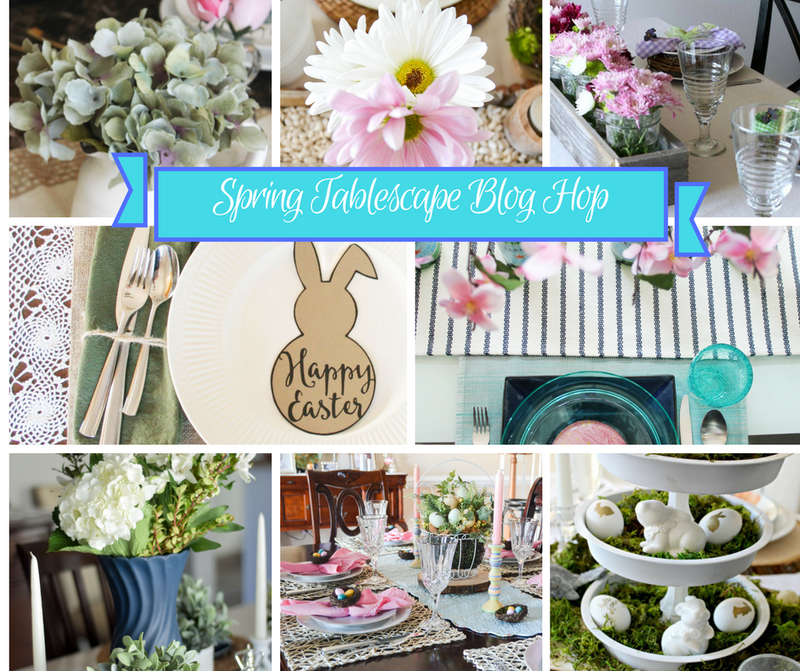 For this Spring table, I thought I would share a few tips that helped me decided on the setting. I also use these tips for any other table I set. Who am I hosting (family only or family & friends)? What’s the season, occasion, or non-occasion? What type of meal am I planning to serve (breakfast, lunch, dinner, brunch)? Is it going to be something formal, informal or casual? This helps me determine what types of plates, cups, cutlery to put out. Will it be indoors or outdoors? What colors will I use? In this case it’s Spring-like colors all the way (pastels in blue, pink, purple, etc. and don’t forget the green). What represents the occasion? This could be used to create the centerpiece and place cards, if any. For Spring, think pretty flowers, green plants, birds, chicks, bunnies, eggs, etc). Not that I sit and contemplate on these one by one though, it’s just good to have a basis to know what I am about. Most times I just wing it and hope something good comes out of it! Seriously!! Because it’s still cold here (and the weather so unpredictable), it wouldn’t make much sense to plan something outside at the moment. So I decided to go ahead and set up a formal table indoors. As soon as I began, the kids started asking if we were going to eat there. Sure, why not? I had not set it for a while since we got our new breakfast table (working on that post) so they were excited. 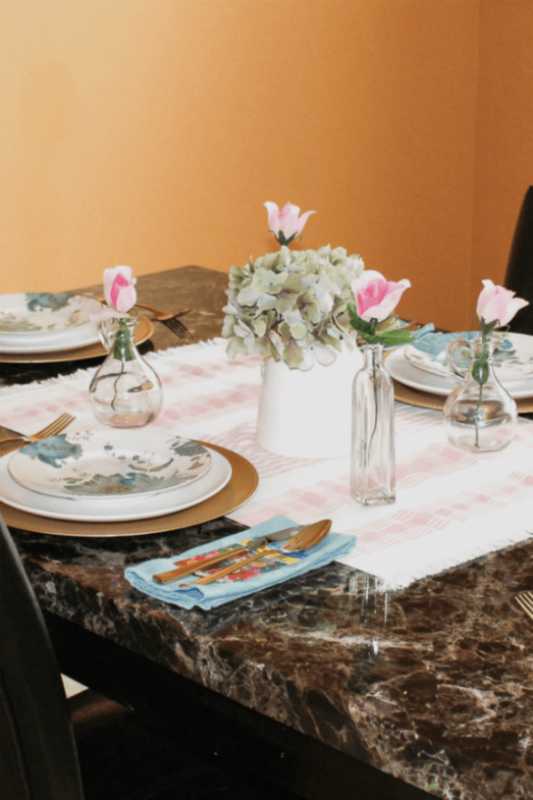 I started off with this kitchen towel that I picked up from Home Goods and used it as a base for the centerpiece. Then I used faux flowers in jars to create the centerpiece. Those little jars are some I had on hand from Michael’s Craft Stores. At first, I thought it would be good to have some herbs or real flowers in vases on the table and then add a ‘grow’ label to them. Real good beautiful flowers are not growing here yet and I did not like the condition of the ones I saw in store. I decided to use the faux flowers I already had instead. The gold chargers were used as the place mats. I wanted to add a little more Spring to our white dinner plates so I layered them with decorative salad plates that we found on clearance at Marshall’s. I love seeing gorgeous and expensive china but I don’t own such a set. Note: If you only have white dinner plates, beautifully decorative salad plates will add that color and extra elegance. Another option is to layer the plates with colorful napkins, place cards, or even small favors to get some Spring color. I’m loving my golden cutlery. I have been checking them out since the Fall and decided to get them after all. I think they compliment the chargers and the specks of gold on the decorative plates well. In place of the ‘real flowers’ that I mentioned above, I went with seed packets and chose to use them as favors. Note: If you are having guests over, they could take them home for planting. Consider placing them in a small clay pot for some added creativity. All in all, I think it turned out OK. I did not add any drinking glasses – they could always be added later. But I hope my tips gave you some idea of how you could set up your own Spring table. What do you think? 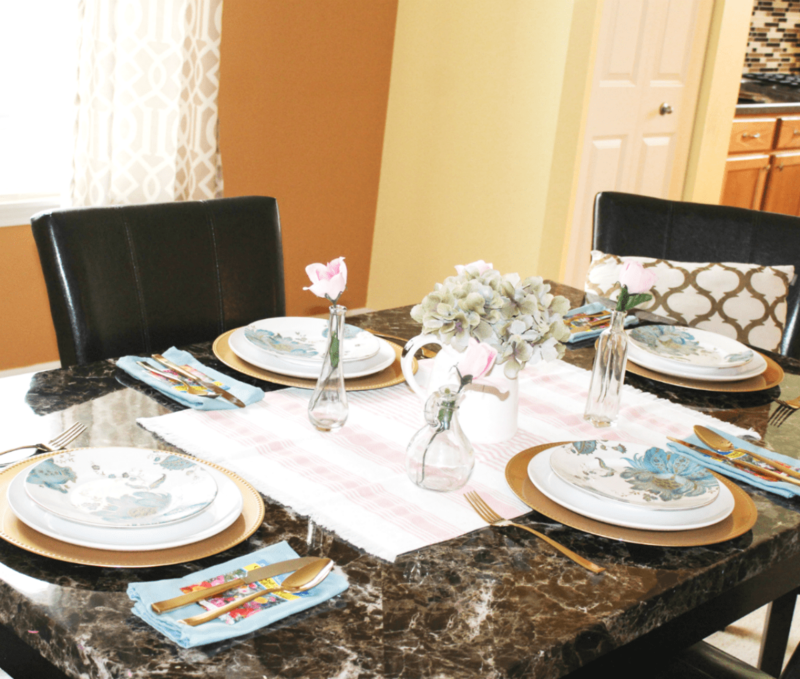 And if you are looking for more ideas, these ladies are also showing how they set their Spring and Easter tables. Simply click on each link below to visit each one. Hope you will be inspired. Great tablescape to welcome spring!!! It was fun hopping with you this week! Thanks Lindsay! I had fun putting it together and yes, so fun to hop around with you, too!! Oh my goodness, Zan — the seed packets are such a cute idea!! I love that!! The idea popped into my head while I was at Home Depot!! LOL!!Thanks!! Very pretty! Love the dinnerware and gold silverware! Thanks Michelle! They are my favorite!! Thank you so much Denise!! It was a last minute decision to use them and I really loved the idea!! Loved “hopping” with you! I NEED those salad plates! Aren’t they gorgeous?! Loved sharing along with you too!! I love this table setting. It simple, but elegant. The seed packets are the best idea. That’s because I’m a gardener, lol. Thanks for sharing. LOL!! Well so glad you like the idea anyway!! Thank you so much Rhonda!